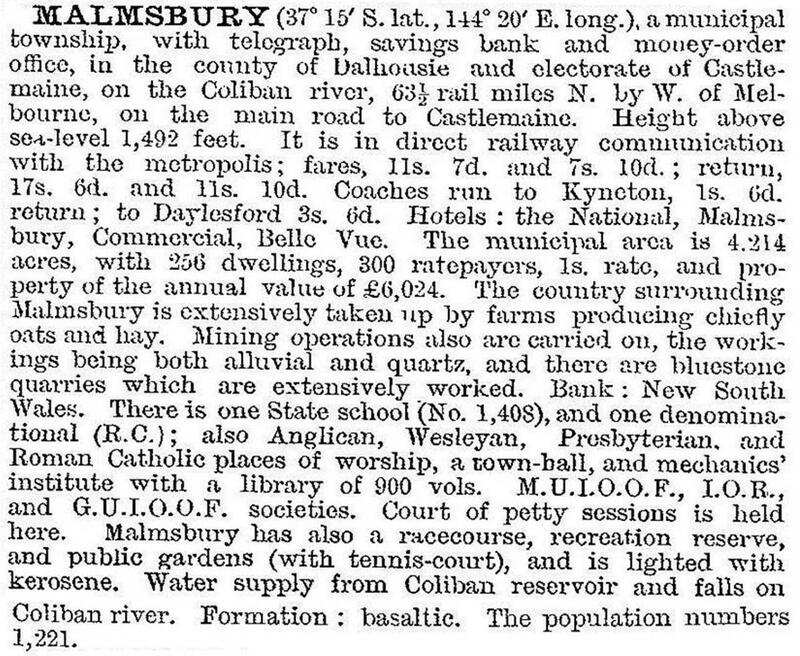 Malmsbury was the main town in the former Coliban gold diggings, extending from Lauriston to Taradale. It is on the old Calder Highway, where it crosses the Coliban River, 10 km north-west of Kyneton and 85 km north-west of Melbourne. Malmsbury was most likely named after the third Earl of Malmesbury, British Foreign Secretary (1852), whose appointment coincided with the opening up of the Coliban diggings. The township grew quite rapidly, as it was also on the road to the Bendigo gold diggings. An Anglican school was opened in 1855, a mechanics’ institute in 1856 and the first of Malmsbury’s two flour mills in 1855. The mechanics’ institute site had previously been occupied by a Caroline Chisholm shelter (c1854). 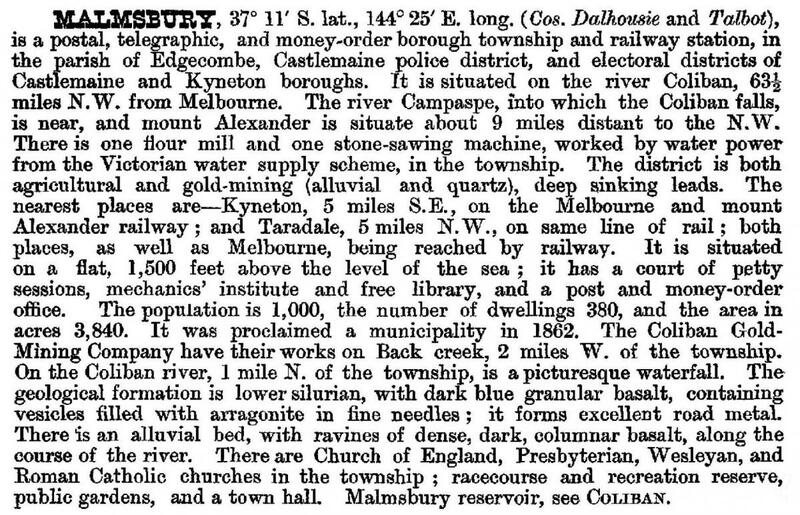 The numerous ruins and hedgerows set in the Coliban Valley bestowed some visual appeal, and the classification of the railway station (1862) and the five-span stone railway bridge (1862) recorded two of Malmsbury’s attractions. In 1984 the botanic gardens were restored, with a lake and islands, and rare trees were named. Bleak House, a short way out of Malmsbury, became a rose garden and nursery. Within the township some of the old buildings were rejuvenated for accommodation, food and craft outlets, and the Blyth Brothers’ mill was restored for similar purposes. There are also a general store and a hotel/motel. In 2008 Malmsbury was bypassed with the opening of the Calder Freeway. Malmsbury’s past industries are evidence from disused quarries and mine heaps. The botanic gardens and civic buildings are an interesting precinct and the mill, the Anglican church (1866) and school (1874) display the uses made of the local bluestone. The railway bridge can be viewed from the gardens, and both it and the railway station are registered historic structures. There are also Uniting (formerly Presbyterian) and Catholic churches (1873, 1921), but the brick Methodist church (1885) has been demolished. The primary school had 87 pupils in 2014. In 2014 Malmsbury received the NBN. The population includes inmates of the Malmsbury Youth Justice Centre (1965), a custodial facility for up to 90 young men.